They are in the preproduction stage of language. At this stage the children will be exposed to everyday and fun vocabulary through games and play. They are in the early production stage of language development. They are able to use key words from the preproduction stage to make familiar phrases and in the present tense. We start asking questions that require “yes”/ “no” answers. The games and instructions are more involved at this stage. They are in the speech emergence stage. They now have good comprehension and can make simple sentences. Here we ask questions that require more complex answers, such as, “ who, what, where and why?” The activities are adapted to the children’s language and motor skills. The children will move through these stages at a natural pace adapted to their learning style. They will be creatively engaged and have fun, learning experiences that last! 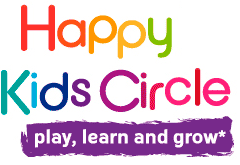 Our Holiday Camps during the school holidays are for 3.5 hours in the morning Monday through Friday —9:00 to 12:30—here too, the groups are based on the child’s level and/ or age —Happy Starters, Happy Jumpers, Happy Flyers. Each workshop has a theme and we take a break for a homemade snack, and we then continue on with our array of activities. The children learn in a fun, creative and nurturing environment through play.